Laird’s BLE652 Bluetooth V4.2 and NFC certified radio module offers robust security and easy programming for enterprise IoT applications. Its small 14×10-mm footprint, optimized low-power schemes, and smartBasic programming language—along with security upgrades such as AES-128, Diffie-Hellman pairing, and link-layer privacy—provide a stable, standalone Bluetooth environment for any embedded design. The BLE652 module operates over the industrial temperature range of -40°C to +85°C and spans a frequency range of 2.402 GHz to 2.480 GHz. Antenna choices include an onboard chip antenna or an IPEX MHF4 connector to accommodate an external antenna. FCC, IC, CE, MIC, and Bluetooth SIG approvals are pending. 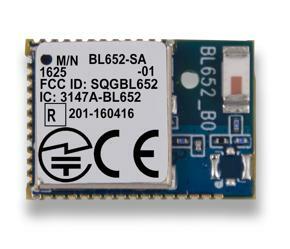 Development for the BLE652 can be performed with either Nordic’s nRF52 software development kit or with Laird’s SmartBasic. The SmartBasic programming language offers built-in functions that replace thousands of lines of C code. It also acts as a bridge between software and hardware so that applications developed for the BL600 series can be ported seamlessly to the BL652. Production quantities of BL652 module and development kit will be available in September 2016.